Our live chat on February 29 with award-winning author Cath Crowley was a little different to our usual live author chats. Joining us on the live chat was a group of young adults from Derby District High School, in the Kimberleys, a remote area of Western Australia. The English class seemed well prepared and very eager as they showered Cath with questions about her inspiration, writing habits and favorite new words. The remoteness of their location was no barrier in the internet world and they were able to chat with Cath at the very same time as our readers in the United States. 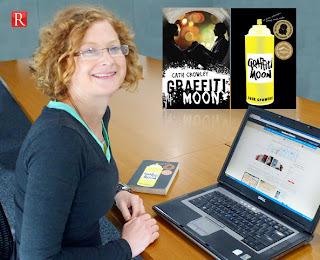 Cath’s most recent book Graffiti Moon has been recognized in her native Australia by numerous awards including the Prime Minister’s Literary Award for Young Adult Fiction. It has just been released in USA on February 14th, 2012 and has already been chosen to be Amazon’s Book of the Month. Being able to participate in evens that have hitherto been limited to more populated areas is a significant opportunity to ensure all readers have the opportunity to meet the authors of the contemporary books they are studying and brings the art of storytelling and writing that much closer to young adult readers. It’s a magnificent way to inspire our future writers and a great way to bring best-selling authors into the family rooms and classrooms of those often isolated by geography, age and mobility. We look forward to bringing you more live author chats in 2012.